Currently, the department’s two primary student funds are the Silverstein Scholarship and the Silverstein Fellowship — the former first presented in 2002 and the latter awarded for the first time in 2007. 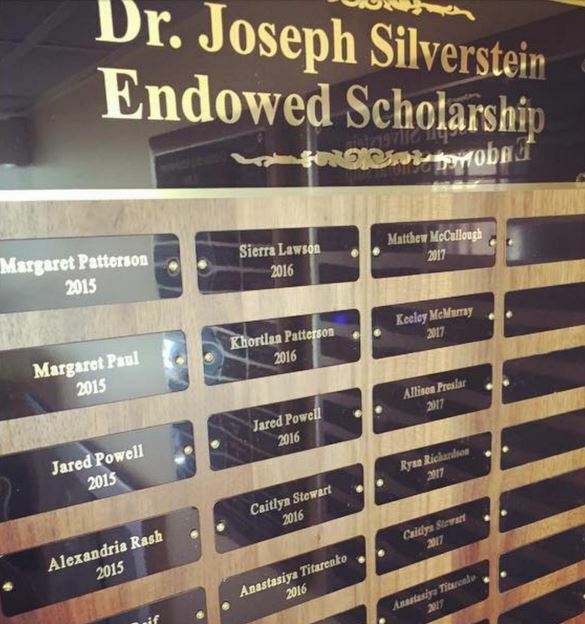 There is no application process for the Silverstein Scholarship; instead, early each spring semester the department’s faculty are provided with a list of REL majors and Judaic studies minors, along with their GPAs. Depending on the amount of funds available to be awarded each year, the faculty ranks these students based on their academic achievements, and awards scholarships valued at either $500 and $1,000 to the top students. (Although graduating students are eligible for this award, priority is given to students returning in the Fall to complete their undergraduate degree.) Near the end of the spring semester, these funds are deposited into each student’s account and the awards are presented during our annual Honors Day luncheon. View a list of Silverstein Scholars. Late in each spring semester, the recipients of the coming year’s Silverstein Fellowships are determined — based on their abilities and academic performance in our classes — by the department chair, in consultation with the faculty and the staff. View a list of Silverstein Fellows. If you would like to make a gift to the Joseph Silverstein Endowment, please do so via the University’s online giving website, give.ua.edu.